The synergistic blend of herbal extracts and essential oils in Flexitol Naturals Skin Nourishing Oil has been dermatologically tested and shown to minimisr the appearance of blemished skin. Regular use enhances skin's natural radiance. 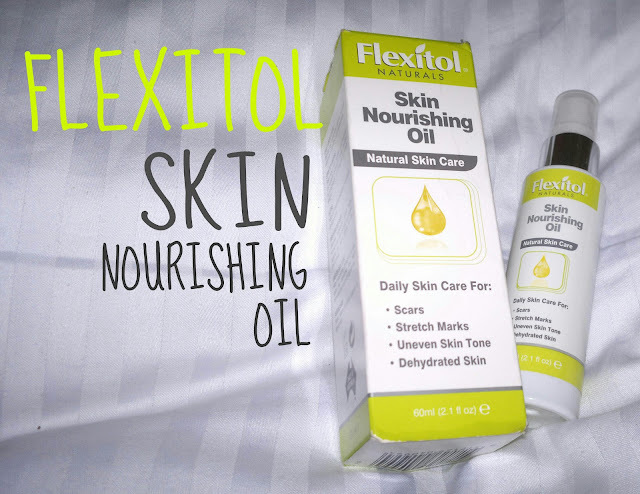 Helps keep skin supple and reduce the visibility of stretch marks caused by pregnancy or changes in body weight. Helps diminish the visibility of new and existing scars. Intensive moisturiser which helps nourish dry skin as well as protect against the harsh effects of the environment. Helps reduce the appearance of agespotsand blemishes. Also helps normalise skin tone with regular use. Helps restore moisture balance to ageing skin. Massage into appropriate area twice daily using, slow, gentle, circular motions or add a small amount to bath water. My skin has been acting up but since I started using this its getting back on track. Its a lightweight consistency with a light fragrance. My skin feels sooo moisturised after one use. I love that it comes in a spray bottle for easy application. I haven't noticed a difference in the tone of my skin yet but its definitely alot smoother.